While some people are out shopping in order to get some of those great deals at Black Friday sales, I’m staying home to work on getting things together for Small Business Saturday tomorrow. It feels like I almost have everything ready, but I’m probably forgetting something and I’ll be scrambling tomorrow morning to get things together and setup at 10am. In case you’re wondering where I’ll selling my wares, I’m back in downtown Waukegan at the Parlor again this year. I will be selling a variety of photographic prints and gift certificates for portrait sessions. 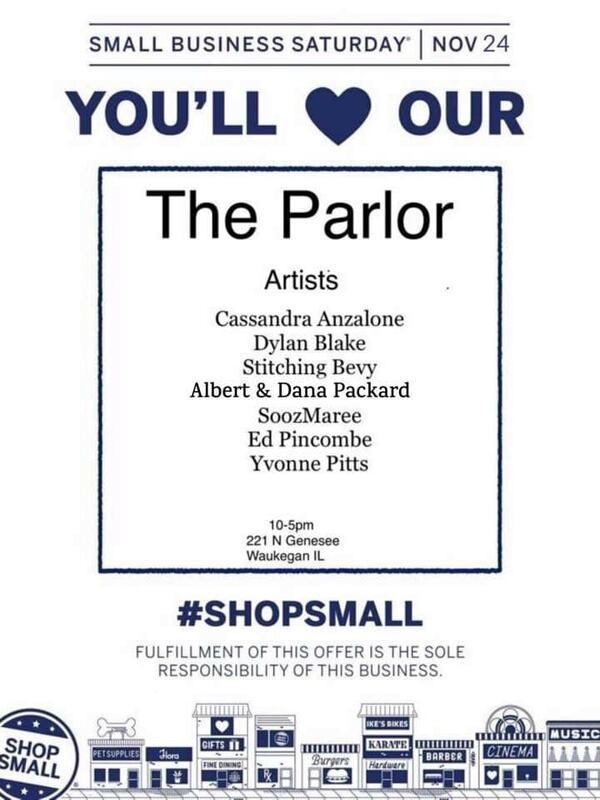 Much like last year, the Parlor will be a pop up shop where I’ll be joined by other local artists and craftspeople. Many of the people that are setting up shop are back after participating last year. The lone newbies we have are Albert and Dana Packard selling their jewelry. Even though there has not been much change with the participating vendors, I’m sure we have plenty of new, intriguing items for sale tomorrow. We have SoozMaree and Stitching Bevy selling crocheted goods such as hats and scarves to stay warm during Illinois’ winter. Meanwhile if you’re into quality graphic t-shirts, Ed Pincombe is the guy you should see. Cassandra Anzelone sells jewelry as well as an assortment of other unique items. And I most certainly can’t forget about the mesmerizing art of Yvonne Pitts. So please stop by and see what we have to offer. In addition to our pop up shop, there are a number of other businesses in downtown Waukegan partaking in Small Business Saturday. Dandelion Gallery will be open to show off their artwork including their small works show. Kapheim Studio will be welcoming customers to stop in and see Thom Kapheim’s distinctive artistic vision. And there will be savings a plenty to be found at Horsefeathers as tomorrow marks the beginning of their end-of-the-year mega sale. This is just a sample of some the small businesses that are a part of this. Hope to see you out tomorrow supporting your local small business.